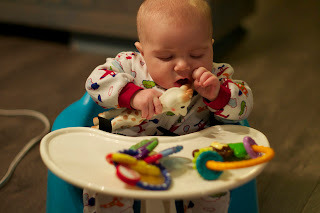 diary of a crazy person: 3 Months Old! This post is a few days late, I don't find myself at the computer that much anymore. I usually just go on Facebook, etc on my phone or iPod while nursing. I am doing a cookbook challenge though so that will give me more motivation to blog. Anyways, Tallet Reid is three months old now and seems SO grown up already. 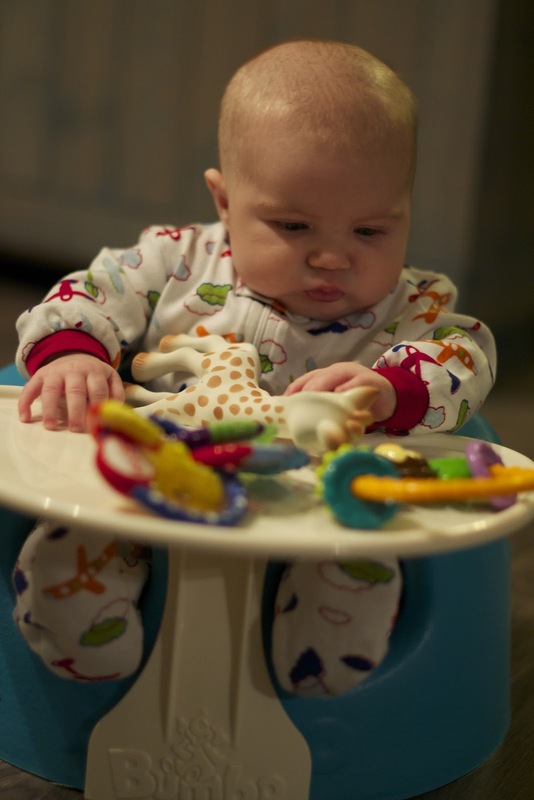 He just started going in his exersaucer and bumbo chair and loves them both! Below are some pictures of him in his bumbo while I was sewing. One minute he was trying to eat his toys. 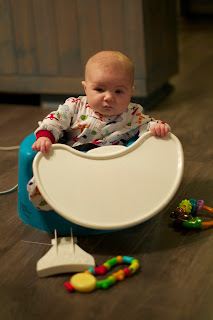 The next minute he had his bumbo tray in pieces on the floor! I had a good laugh. 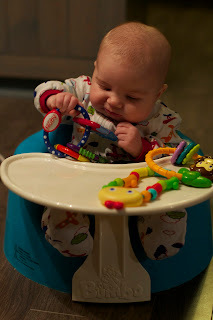 He giggles a little bit now, smiles a lot, talks and loves to chew on our fingers. We swaddle him with one arm out now and he is able to sort of soothe himself by sucking on his fist. It is important to me that he learns to soothe himself because in 3 months he is moving up to his room for night and naps! He has his first cold right now and it is SO sad to hear him cough and be stuffed up. 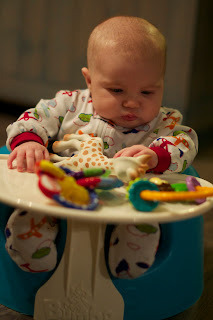 I am loving being at home, being his mommy and watching him learn and grow. I thought I might get bored at home with a baby, but my days are still pretty full. Any my house is still pretty messy. I am sure I will get more efficient as time goes on! Ohh, those darling chubby cheeks!! Happy 3 months, Tallet and Mama!